There are tens of thousands of weapon storage racks in use by our military. Most of which are 12-18 years old. These older design systems are creating a serious problem. Weapons have changed. Equipment has changed. The sheer volume gear stored in armories has changed. What has not changed is the size of the armory and flexibility of the old weapon rack systems. Currently, there is a push underway to replace these outdated weapon racks. Older modular component-based systems like these are being scrapped and new racks are being installed. The SecureIt Weapon Storage Platform,also known as CradleGrid, has become the standard in modern armories and weapon storage facilities. Most of our current projects involve removing and replacing these old “universal weapon rack” systems. In many cases, the cabinet or shell is in OK shape. It is simply that the old design cannot accommodate modern storage requirements. It is simply that the old design cannot accommodate modern storage requirements. To affordably address this obsolete weapon rack issue. SecureIt has developed a “retrofit kit”. It is designed to replace the interior of these old complex weapon rack systems. Instead of scrapping old weapon racks entirely, military units can now upgrade their old units to the modern standard. If the old weapon rack shell or cabinet is good shape, the SecureIt kit can be easily installed in minutes. Military units can save upwards of 70% off the total cost of an armory renovation. Military units can save upwards of 70% off the total cost of an armory renovation. 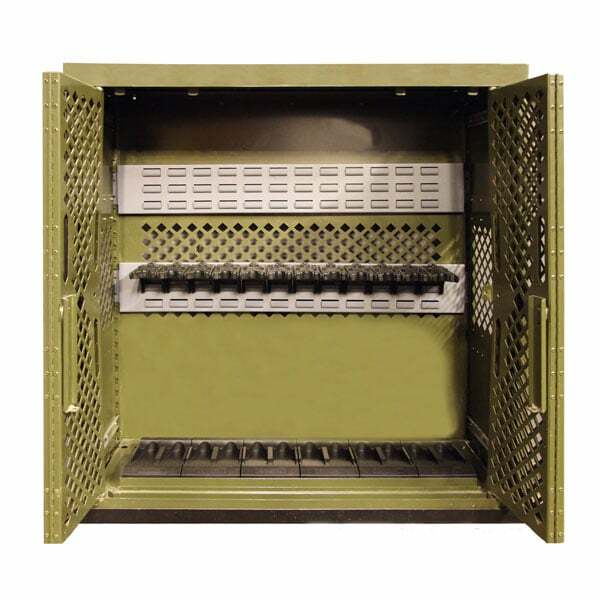 The SecureIt CradleGrid system replaced hundreds of different brackets and components with just 1 patented upper saddle (cradle) and the grid panel. The panels quickly install into the old cabinet. Old racks with the new CradleGrid kit will now properly store all modern military rifles, machine guns, mortar cannons and most shoulder launch weapon systems. Units can do the retrofit themselves, saving additional installation costs. SecureIt also offers full turnkey upgrade solutions. In most upgrades, customers order a handful of new Model 84 weapon cabinets along with the upgrade kits. This is to allow flexibility when storing longer weapons. The old style weapon racks were designed to be stacked. While this works for M4s and other smaller battle rifles, it does limit the length of weapons that can be stored. Taller 54″ racks were also available back in the day and can be upgraded however most groups go to the Model 84 as it provides better long-term performance. Upgrading the old cabinets to modern standards.